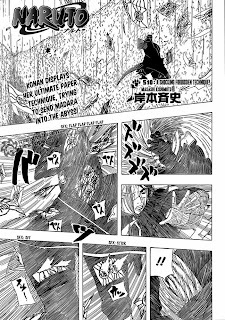 Konan display her ultimate paper technique, trying to send madara into the abyss. After in Madara's side all that time, Konan know about Madara's weakness. Madara can only remain intangible for about five minutes at a time so Konan was preparing six hundred billion explosive tags to make Madara busy until ten minutes. However, after konan's paper angel technique wore off, Madara still succesfull to escape from the explosion using Izanagi, the forbidden Uchiha technique. A technique that can only be used by someone possesing both the power of Uchiha and Senji. Konan got beaten up by Madara and has been forced to revealed the place where she hid the rinnegan.